I need a pudding that will please small children! | Keeps Me Out Of Mischief! I need a pudding that will please small children! 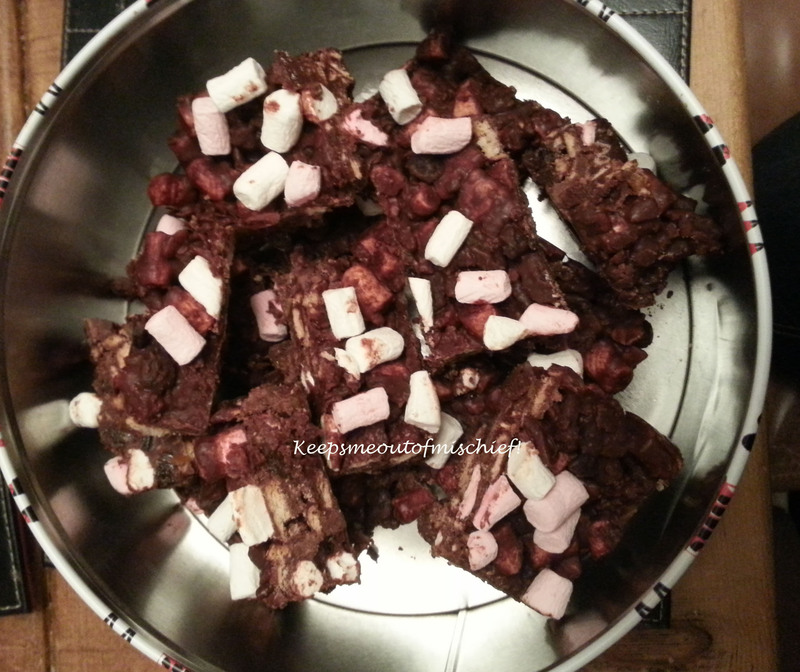 Small children coming to visit – no proper food in the house (and by that I mean disgustingly sweet and full of things that we wouldn’t normally want them to eat!). Must do some cooking. I had a whole heap of half finished packets of naughty things and I thought that they would be put to good use in this Refrigerator Cake. You will need: 170g crushed biscuits (I used chocolate sandwich biscuits – the more chocolate the better really! ), 60g mini marshmallows, 175g of any combination of mixed fruit/ glace cherries. candied peel etc, 60g golden syrup, 100g butter and 190g dark chocolate. Grease and line a 20cm square baking tray and clear a space in the fridge. Place the golden syrup, butter and dark chocolate in a bowl over a saucepan of boiling water and stir gently until all the chocolate has melted. Put all the dry ingredients in a large bowl and mix with the heated mixture. Pour the mixture into the prepared baking tray and place in the fridge for at least 3 hours to set. Remove from the fridge 20 minutes before serving. Variations – you could add nuts (I didn’t do this as I was feeding under threes). Very well received by very messy children – definitely needed the baby wipes afterwards!